So that we would get our fill of some form of veggies, my parents decided to order the Buddha's Feast sporting mung bean vermicelli, wood ear, white fungus, snow peas, water chestnuts, carrot, Napa cabbage and bean curd stick. There was plenty of wok heat as well as seasoning to make this dish tasty and texturally on point. This was one of the better versions we've had of late. Next, we had the BBQ Pork Belly & Pineapple Bun which was surprisingly good. Not that we weren't expecting it, but the addition of pineapple added a different type of sweetness and texture. 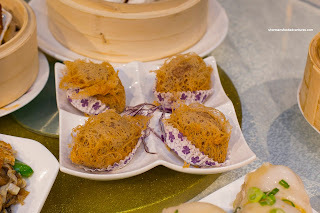 Furthermore, the bun itself was soft and airy with an appealing elasticity. As much as this was sweet on sweet (including the topping), it wasn't over-the-top. With 2 dishes that essentially were almost in the same shade of reddish-brown, it was at first hard to see which was which. However, one was definitely better than the other. Although the Braised Beef Tendon and Tripe were texturally on point, the beef tripe was overly gamey. 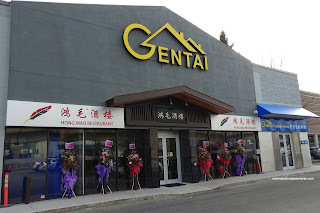 Too bad really as the dish itself was fine. The tripe was tender with a chew while the tendon was soft without being overly so. There was background spice accenting the sweet and salty sauce. 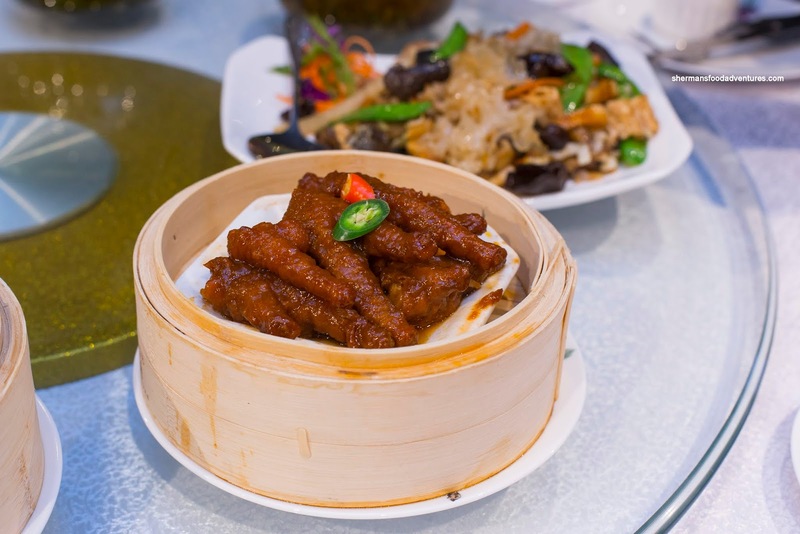 Exhibiting similar flavours, the Phoenix Talons (Chicken Feet) was executed properly. I normally do not prefer the feet to be segmented, but since they were so plump, it did not impact their texture. Tendons and cartilage were tender underneath the perfectly fried and subsequently steamed skin. Sporting a slightly over-chewy dumpling skin, the Ha Gau was still good despite this. Normally, I'm not a huge fan of bamboo shoots in a shrimp dumpling, but the large pieces were not pungent at all. Moreover, the crunch was a nice textural contrast from the buttery and meaty snap of the shrimp. 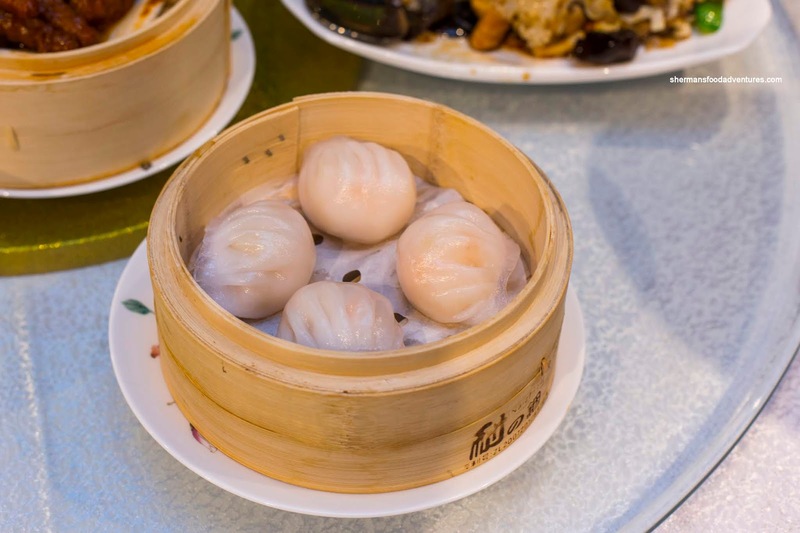 I particularly enjoyed the natural sweetness and shrimp aroma including the unmistakable hint of sesame oil. 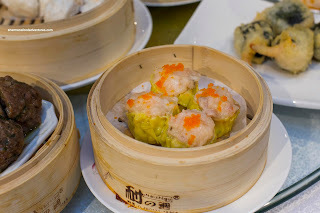 As much as this was good, the Siu Mai (Pork & Shrimp Dumpling) was even better. These were downright juicy and buttery bouncy. 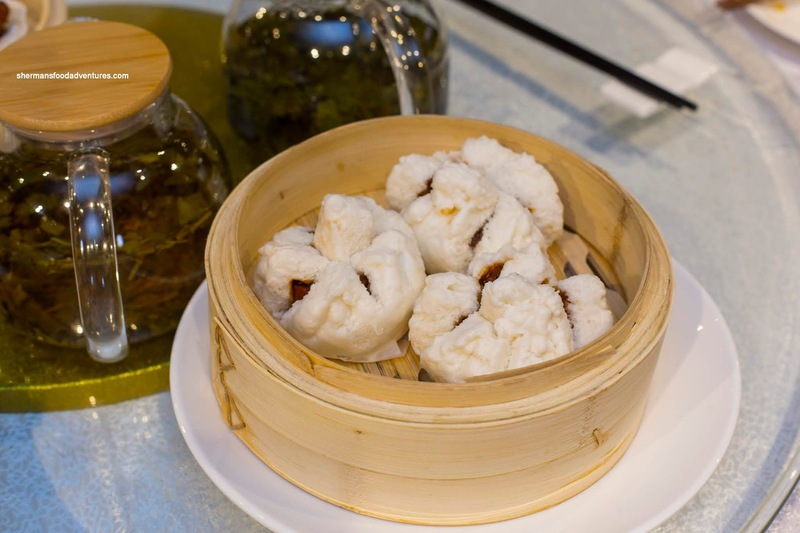 If there was an ideal texture for this dumpling, this was it. The combination of bouncy pork with the snap texture of the shrimp made for a good mouth feel. Flavours were on point being sweet and savoury. Normally, we get the shrimp rice noodle roll as well as the donut rice noodle roll and call it a day. However, we didn't order the shrimp this time around. Rather, we did stick with the Donut Rice Noodle Roll and included the Crispy Bean Curd Sheet with Fish Paste Rice Noodle Roll as well. Although a bit too much green onion for anyone's liking (except for Viv), the rice noodle itself was soft and thin with an equal amount of elasticity. We appreciated that the dried pork floss was rolled inside, so it didn't fall all over the place. As for the donut, it was not dense and extremely crispy. 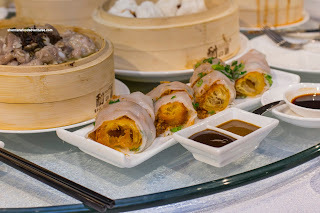 My favourite item of the entire meal was the fish paste roll. 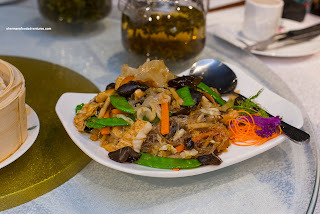 I really enjoyed the crispy bean curd skin that gave way to a airy and fluffy fish paste filling. It was moist and had an appealing rebound. They even added small bits of donut for extra crunch. 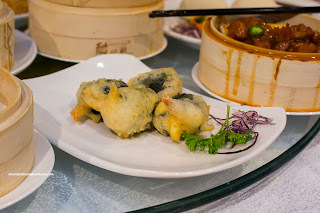 Onto 2 fried items, we tried the Deep Fried Duck Meat and Taro Paste Dumplings as well as the Deep Fried Prawns with Seaweed. In terms of execution, the taro dumplings were textbook and then some. Beyond the crispy and light exterior, the layer of mashed taro was fluffy and not overly greasy. 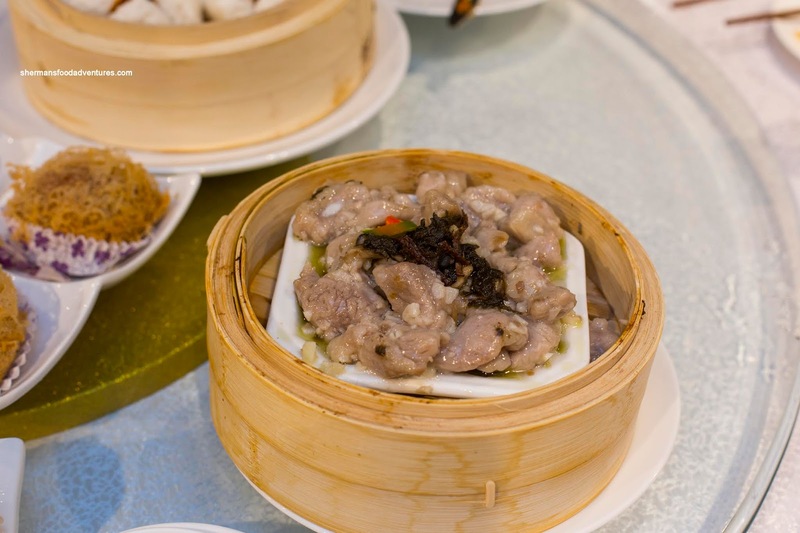 Inside, the duck gave the dumpling a meatier and leaner texture while adding the unmistakable essence of duck. Despite its description on the menu, the fried prawns were actually surrounded by a significant amount of buttery moist shrimp paste. This was wrapped in seaweed and fried with tempura batter. This ate a lot better than it looked (not particularly photogenic) with a crispy exterior giving way to bouncy shrimp paste and a whole cold-water crunchy shrimp in the middle. 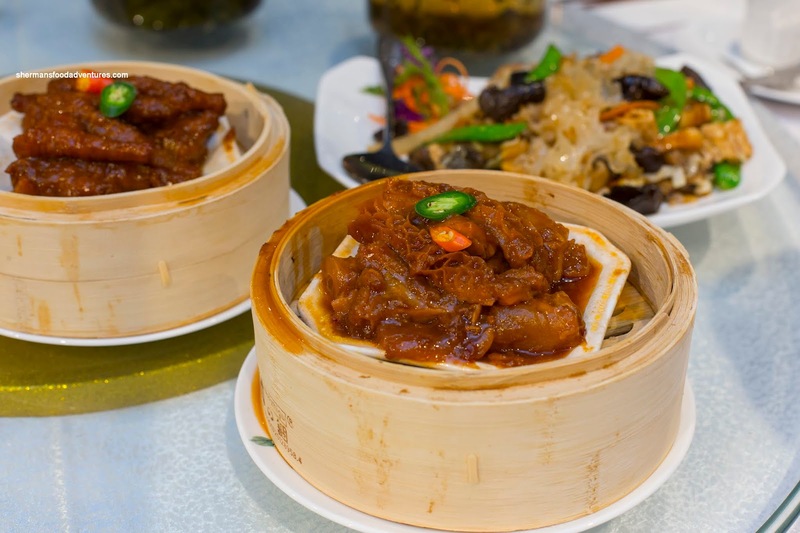 When I first tried the Steamed Pork Spareribs with Garlic, I was perplexed why it tasted so different. Yes, there was a tonne of garlic present, but with the addition of pickled mustard greens and dried orange peel, there was a certain level of umaminess and citrus-vinegariness. The pieces of pork were mostly devoid of bone and a little fatty. However, they were tender with a meaty rebound texture. I did find the ribs rather greasy though. As much as the texture of the Beef Meatballs were textbook bouncy with retained meatiness, there was far too much cilantro for my liking. Again, Viv didn't mind it (since she loves cilantro), but I found it out-of-balance. I guess this would be enjoyable based on your preferences. 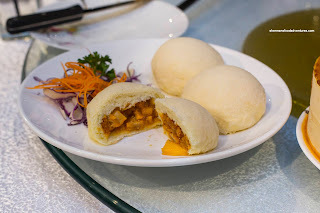 Having tried the baked BBQ pork buns didn't deter my son from ordering the Steamed BBQ Pork Buns as well. 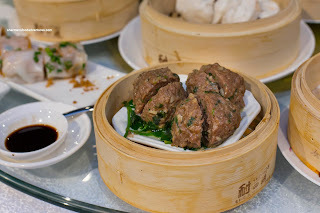 These were just as good with a fluffy bun encasing lean BBQ pork that was glazed with a sweet and savoury sauce. 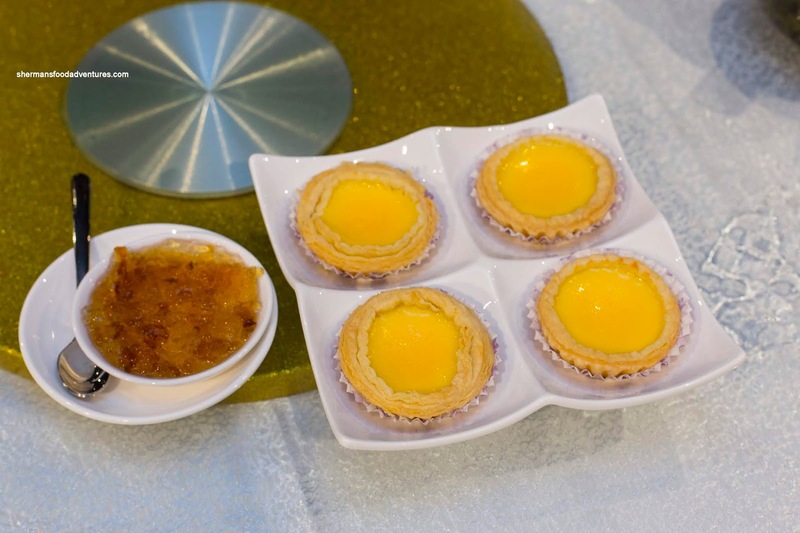 For dessert, we went with the Baked Egg Tarts served with a sweetened gelatin on the side. The egg tarts themselves were quite good with a flaky shell and silky egg custard. I thought there wasn't enough sweetness, but at the same time, that is a whole lot better than being too sweet. 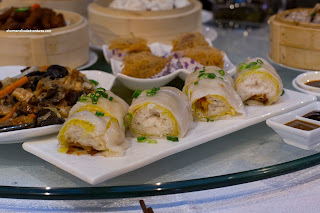 So although Hong Mao is mainly a Northern Chinese restaurant, their predominantly Cantonese Dim Sum service was well-executed and on point. Pricing is on the higher end, but not unreasonable for this class of restaurant and level of service.